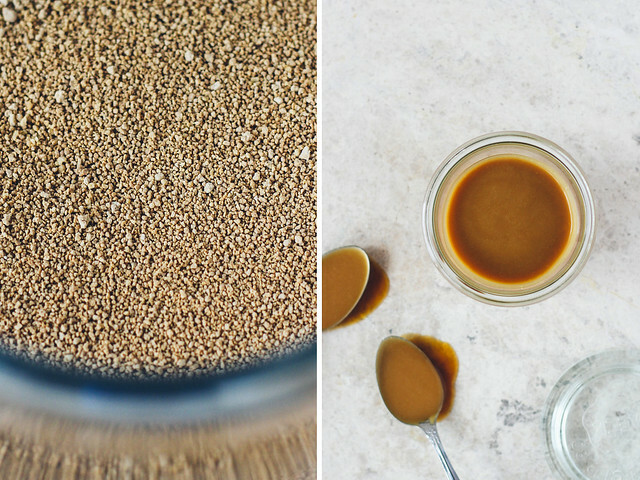 I've been looking for a way to make caramel sauce that is less involved than my other recipe. Because I don't have time to wait around for 25 minutes, watching as coconut milk and sugar evolve into golden, syrupy goodness. And you probably don't either. In the amount of time it takes for a pot of caramel to come to life, you could watch a rerun of The Office. Without the commercials. Or you could clean the kitchen. And when you're done with that, maybe organize all of your stuff in the bathroom? No? Fine. But I really don't think it's necessary to have two dozen replacement razor heads or a year's supply of bio-rutin supplements or three different conditioning treatments taking up precious bathroom real estate. Speaking of conditioner, maybe you could take a shower? And wash your hair while you're at it because not washing your hair for four days is gross. I don't care if you're trying to protect your cylindrical filaments from the arid Colorado climate. It's not cool to go on a hair washing strike when you share a bed with another human being. Your hair is dirty. Wash it. Did that get weird? That kind of got weird. 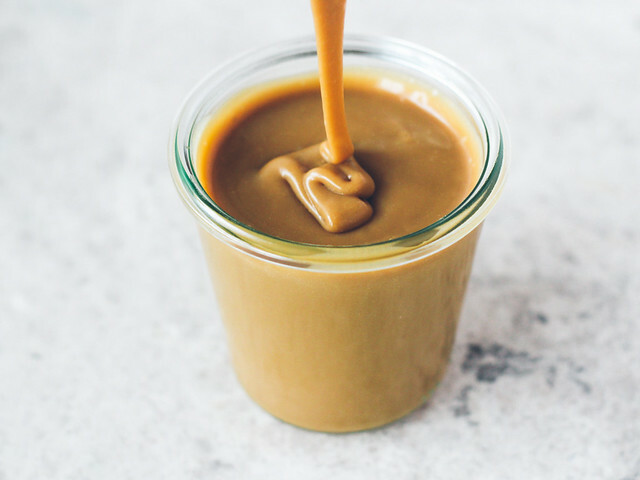 Anyway, I'm not saying we should ditch the old recipe entirely (ok, maybe we should), but this recipe is nice to have on hand when you don't have half an hour to devote to making caramel sauce. It's also nice to have on hand when you want to make caramel apple crumb pie at the eleventh hour. Like, maybe later this week? Notes: Feel free to use brown sugar or muscovado sugar in place of the sucanat - both will produce a similar result (although the caramel may be a bit darker) (it may also be super light if your sucanat is lightly colored - just add a touch of molasses). Oh, and say you forget to whisk your caramel for a few minutes and it burns and sticks to the bottom of the pan. But you don't find out until you go to whisk it and burnt flecks of caramel ruin your perfectly golden sauce. No worries! 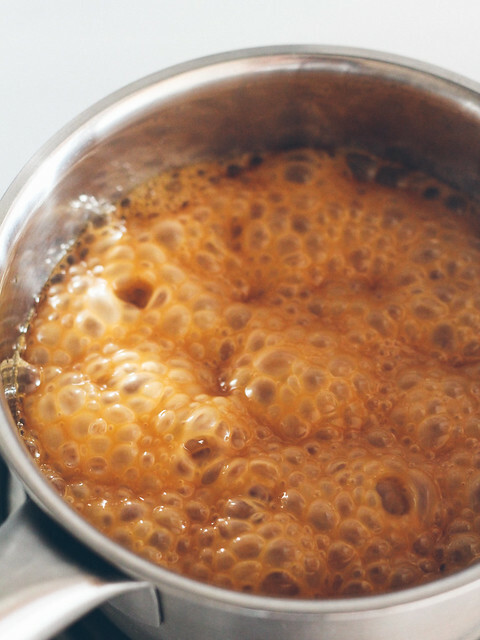 Simply pass the caramel through a fine mesh strainer a couple of times then place it back on the stove (in a clean pot, of course) to finish cooking. Crisis averted! Start by opening the can of coconut milk and separating the thick, white milk fat from the water. Add 1/4 cup of the coconut water to a small saucepan set over medium-high heat. Whisk in the sucanat and sugar, then bring to a boil. Boil for 5-6 minutes, whisking only a few times, then stir in 1 cup of the coconut milk fat (you may have more or less, depending on your can of coconut milk - that's ok). Reduce the heat to medium and boil the mixture for 5 minutes, whisking every minute or so. If you added less than 1 cup of coconut milk fat, you'll want to cook the mixture for an extra 2-3 minutes. Off the heat, then transfer the caramel to a glass jar and cool on counter, uncovered, until the caramel reaches room temperature. 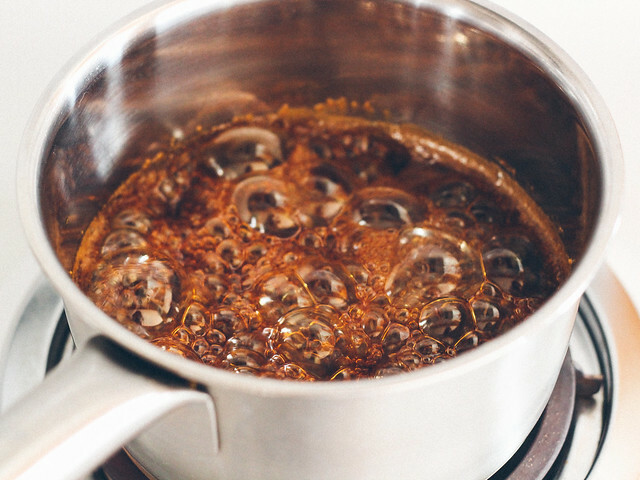 Refrigerate for at least four hours before using; caramel will thicken as it cools. Will keep for up to one week.